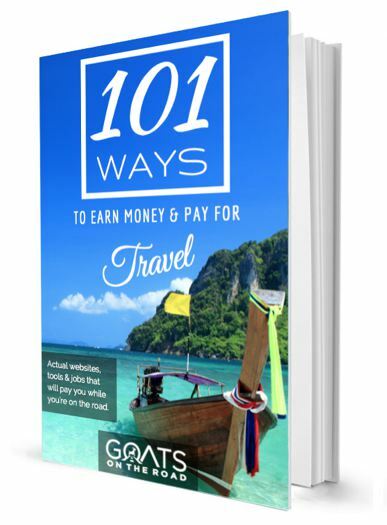 Goats on the Road Posts » Digital Nomad Lifestyle » Online Spanish Classes – We’re Finally Learning a Second Language! People often assume that just because we’ve travelled a lot and lived in a few different countries that we must speak more than just our native tongue. These are both legitimate, and annoying assumptions! It’s not annoying that people ask us or think that we speak two languages, it’s just that we’re frustrated and disappointed with ourselves that we haven’t yet been able to become fluid (let alone fluent) in another language. People from Europe can usually speak a minimum of 2 languages, most speak many more, but people who are native English speakers tend to only speak English, what’s up with that?! To be fair, yes we are from Canada, but most people who speak French are from the east, and we grew up in the west, the very west. I took French classes throughout high school, but since no one around me (for about 4,300 kms) spoke any French, I didn’t exactly have anyone to practice with, and therefore, forgot most of it. Nick took Japanese in high school, but let’s be honest, he just did it because not much is expected of you if you decide to learn such a hard language – I’m not being mean, he told me that’s why he chose Japanese! When we lived in China for a year teaching English, we did learn some Mandarin. We could go to a restaurant and take a taxi, but that’s about it. The Chinese languages are one of the top 4 hardest to learn for native English speakers, so we don’t feel too badly about not being able to speak more. See, Chinese is one of the hardest! 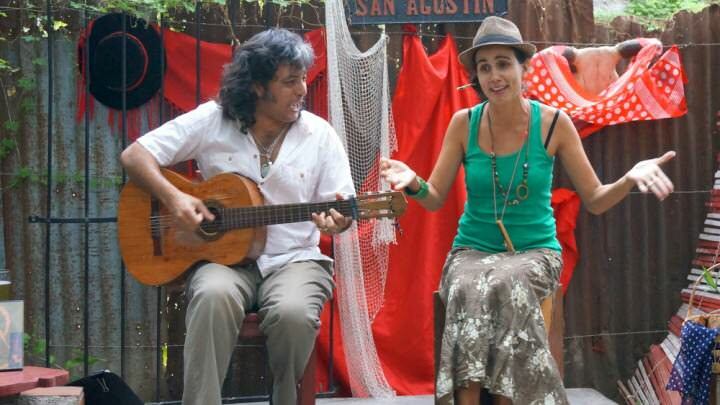 We then travelled to Mexico, Guatemala and Cuba, where they speak Spanish. 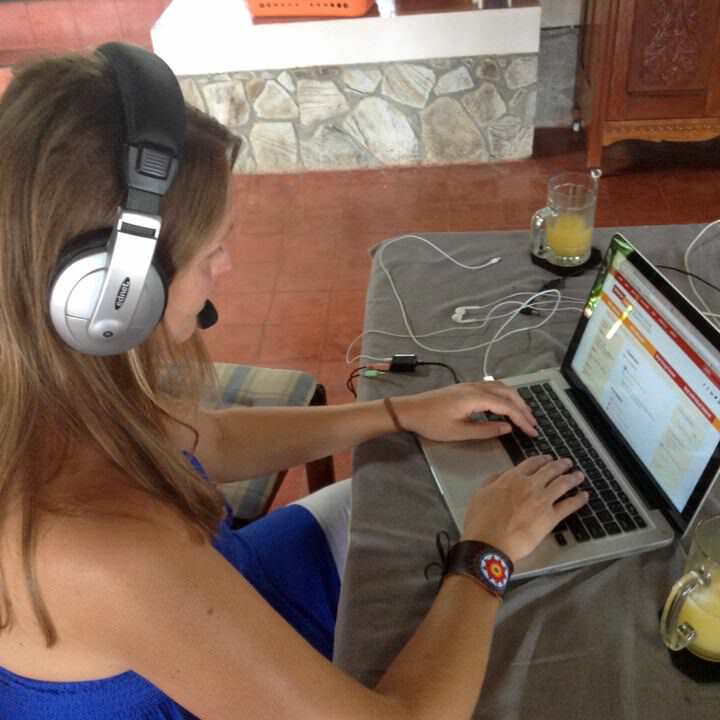 When we arrived in San Pancho on the west coast of Mexico, we decided to take Spanish lessons! 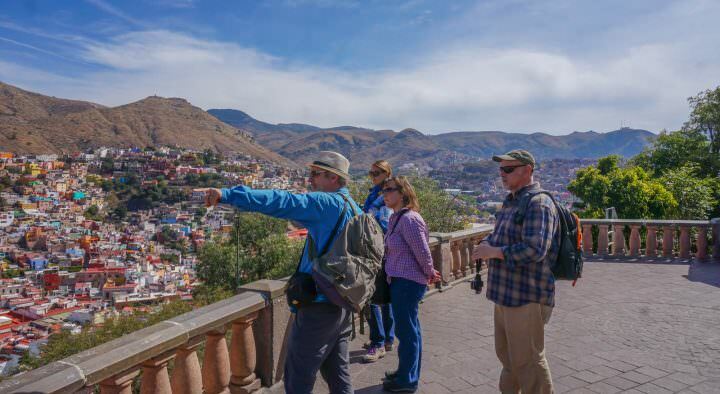 We were good scholars and learned a lot actually, but (here comes another excuse), since we were in a very popular tourist destination, the Mexican people spoke English. We used our Spanish throughout the rest of our time backpacking in Mexico, but felt like our level 1 abilities couldn’t get us very far and we were better off speaking English. 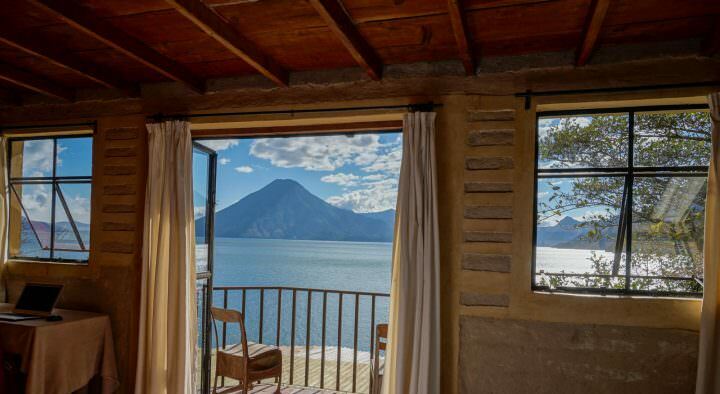 Living on Lake Atitlan in Guatemala was fabulous. We loved the seclusion, the peace & quiet, the stunning vistas and our friendly French neighbours, but due to the isolation, we didn’t find ourselves interacting all that much with Guatemalans. When we would visit the “big” village of Panajachel, we would use our Spanish abilities at the shops, but that was only once a week. We did OK communicating in Cuba, and many of our casa particular owners didn’t speak any English, so that was a great way for us to practice. But even then, Cuban Spanish is much different from the rest of Latin America! We loved meeting Joel and Ivet in Cuba, but it was very difficult to communicate, as Joel didn’t speak English. 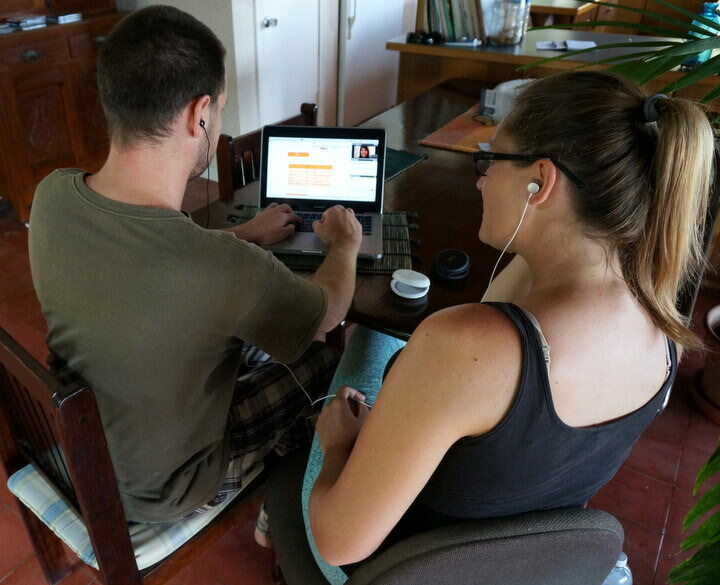 We’re tired of only being able to converse in one language, and while we were travelling in Cuba, we decided that when we got to Grenada, we’d learn Spanish online. The only issue is that Grenada’s official language is English, although in reality, it’s a heavily accented Caribbean version of English 🙂 This will make practicing Spanish a bit difficult, but that’s OK. When we arrived in Grenada a month ago, we were contacted by Spanish Marks (how perfect is that?! ), who saw that we had lived in Guatemala, where the school is, and knew how much we loved it there. This school is based in the city of Quetzaltenango, a place we really wanted to visit, but just didn’t have the chance to. We came up with a plan for Nick and I to take Spanish lessons with the head teacher, Sandy, who has 10 years experience in teaching Primary to University levels. 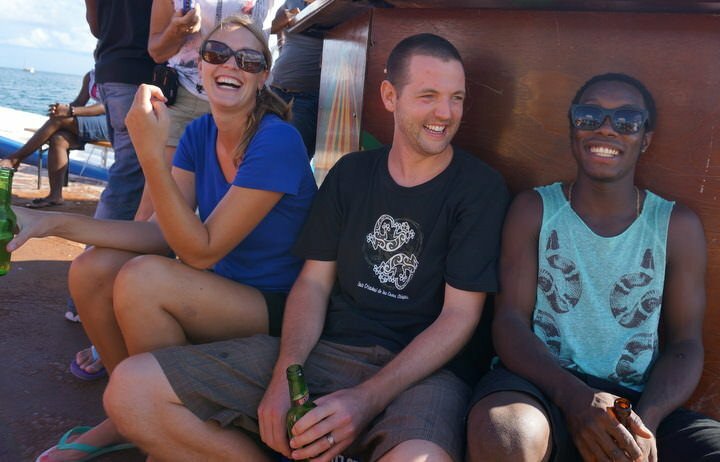 This is our Grenadian friend, Rolando, he’s great, but half the time we can’t understand him! Guatemala is the place to go if you want to learn the Spanish language. Many people go to this Central American country specifically with that goal in mind. But, what’s great about learning online, is that we don’t even need to fly to Guatemala, we can learn from the comfort of our own home in The Caribbean, Europe, North America or wherever we travel to. Rustom, who is the co-founder of Spanish Marks, is from England and after a voluntary position at a NGO in Guatemala, he was hooked on the country! From the warmth of its people to its diverse landscape of volcanoes, Mayan ruins and unspoilt beaches, he loved it all. 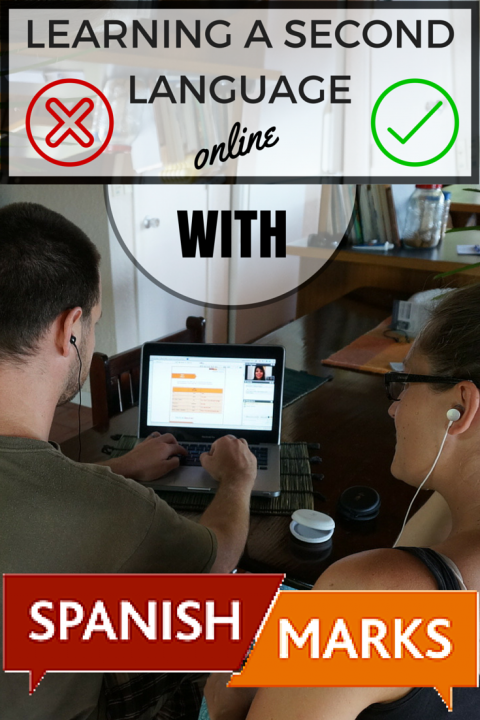 Together with Sandy, this ethical online school was born! We’re all about supporting tour agencies, hotels and small businesses that give back to the communities that they’re a part of. Approximately 51% of Guatemalans live in rural areas, and despite agriculture being the backbone of the country’s economy, poverty is especially endemic in these areas. Rural communities have traditionally been excluded from Guatemala’s social and economic mainstream, meaning they suffer disproportionately high levels of poverty. The situation is made even worse by corruption, a lack of educational resources and the after-effects of a 36 year civil war. In order to help the people in and around Quetzaltenango, Spanish Marks supports and donates a portion of their profits to the local charity, Asociación Fatima. This association provides food, medical supplies, school equipment and shoes for around 250 families in the area. Our Spanish lessons are from Monday to Friday, 50 minutes each day. On top of that, we are supposed to study and do our homework before every class. All we have to do is login to our account on the website, press “join class” and after a few moments, Sandy’s smiling face pops up, as does a chat box and a whiteboard! It’s sort of like Skype in that we can all see and hear each other, and we can type a sentence or a question in the chat box if we need to. We love learning online and being able to wear our PJs! The text books and materials are all on the screen for us to see, and there’s a “whiteboard” as well, where the three of us can interact. It’s a pretty cool set-up actually. Sometimes we reply to questions verbally, while other times we are able to learn by typing the answers out for Sandy to review. All we need to learn online are some earphones and our laptops, as the webcam and mic are already built into our computers. You can either learn 1-on-1 with the teacher, or in a group of no more than 3 other students. Spanish Marks gives a free trial class to see if you like it, and to figure out which level you would be at: beginner, intermediate or advanced. Lessons are available 7 days a week, 24 hours / day! So, just pick a time that works best for you. Click here to sign up for a free lesson. We can honestly say that this is a really great program. We love being able to sit in our living room, in our pajamas, with a cup of coffee and not have to go to an actual school! Sandy is an excellent teacher and she explains things very well. If we have questions, she’s able to answer them. If we’re feeling sluggish, she’s there to encourage us. Sandy speaks slow enough for us to understand what she’s saying, and uses a mix of English and Spanish to explain the instructions to us, which is great for learning. So far, so good with Spanish Marks. The class time of 50 minutes is a little bit short, but then again, we’re meant to do more studying and practicing with each other at home, so in reality, we spend about 2 hours each day practicing our Spanish and if we really wanted to, we could do back-to-back classes. We also feel that we would benefit more from the class if there were more written exercises for homework, and if the online homework included the answers, so that we could test each other and make sure we’re studying the proper language and sentence structures. 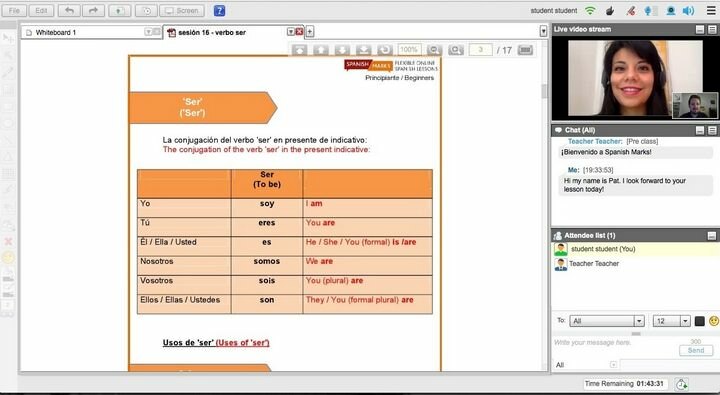 In our opinion from our first three week’s with the program, we can honestly recommend Spanish Marks as a great way to learn Spanish online. Now all we have to do is travel to a Spanish-speaking country so we can practice all that we’ve learned! How many languages do you speak? Would you be interested in learning online? Share with us! A special thanks to Sandy and Rustom for providing us with excellent lessons! We’ve really been enjoying our classes and will be recommending Spanish Marks 🙂 As always, all thoughts, opinions and reviews remain our own, despite any complimentary services received. Interesting read. I come from small country in the heart of Europe called Czech Republic and I am also traveler. It’s pretty interesting that you mentioned that people from Europe are bilingual, but because we got to be. If I had spoken only Czech, I wouldn’t succeed much with traveling. It’s something that we must learn to get proper jobs and so on. But for native english speakers it’s much different, for them(you) is learning another language something special and if people don’t have to urgently learn another language because of job or something else they probably won’t do it. And that’s why you can’t compare that people from Europe speak 2 or more languages. However, we usually learn another language (English!) since kinder-garden, but also on high school we have to choose another one of these three languages – Russian/Spanish/German. You can’t blame yourself that you don’t speak 2 languages when you don’t have to and it is partly school related issue. However, learning another language (not English) not only for job/traveling opportunities but also for your brain power, memory and communicating skills. 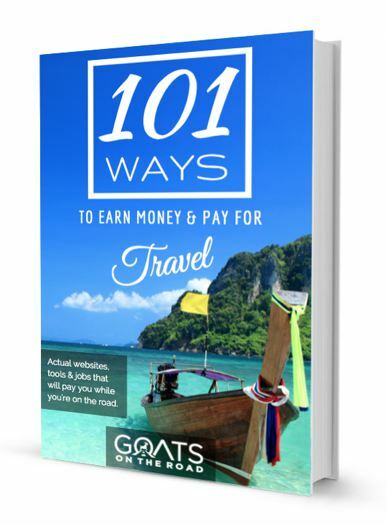 When you are traveling, you might start with some basic phrases then continue to more complicated and some situational phrases or check some online course that will help you manage another language very easily. If you wouldn’t mind, you might find some useful stuff here on speaklikenative.com. Hope my comment is not offensive. Thanks for your comment, no it’s not offensive! It’s true, that people from Europe need to speak another language in order to communicate with the rest of the world. We’re “lucky” that English is the common language, but at the same time, it makes us a bit lazy 🙂 You’re right to say that leaning another language is good for your mind, brain power and so on. It’s always good to learn! Sounds like a wonderful program. I’m pretty old school and love my CDs or even taking a class but this seems like a fun and interactive alternative. I too like taking an actual in-school class, but since we’re travelling and always moving around, learning online is an excellent option! Good for you! I’ve always wanted to be fluent in another language — particularly French. I’ve made short-term efforts to really immerse myself in courses (like Rosetta Stone), but never seem to have the time to keep it up. Before I travel, I try to learn as much as I can about a language and at least manage to get comfortable with the basics — French, Italian, German, Spanish. Thanks for the encouragement to try to become more proficient in other languages, if not fluent! Good luck with your classes. I LOVE learning new languages, especially when I’m traveling. I think it helps to show the locals that you’re making an effort! This program looks amazing – love the hands on aspects of it! Oh a topic near and dear! I took Spanish in high school and French in college. Needless to say, I spoke neither fluidly by the time I left. I decided to focus on Spanish, and took classes (once a week) for over 2 years. I’m to a point where I am just as frustrated as I was when I started: I can read nearly everything, understand about 80% of a general conversation (asking them to slow down if needed), and speak about 60%. I don’t really know if I can get from fluid to fluent without time immersed in a Spanish-speaking country. I’m also extremely perfection-ist about my Spanish (well, and English), and I HATE making mistakes which is the death of trying to speak better. I guess it’s good I can function in nearly all travel situations, and discuss things like politics, health, etc, at least at the superficial level. So congrats for starting & studying! We have long lamented our lack of a second language. We’ve tried to learn Spanish on a number of occasions through Duolingo, and while it’s a good program, after finishing it all I still don’t have the confidence or ability to listen and comprehend what actual people in the real world are saying, much less respond back in an intelligent way. I’d definitely be interested in taking these courses, just to see if it’s a more productive way of learning. Good luck! Aw I love this post! We are the exact same, lazy Brits who weren’t pushed at school (Craig wasn’t actually allowed to pick up Spanish, his Mum even complained to the school). We went to school in Cusco, Peru, after the embarrassment of being on a trek to the Colca Canyon and being the only couple who could not speak Spanish. We are hoping to go to Guatemala in February and are hoping to go back to school there but will look into this online course. Great post, thanks guys. Wasn’t allowed to learn Spanish in school?! Really? I totally understand about being embarrassed…we’re always the only ones that don’t know French or Spanish, while all of the other tourists do! Guatemala is an amazing country, definitely check out Spanish Marks if you go! I speak English and reasonable French. I did try learning German for a whole term, but found it quite impossible. I guess if I tried again, it would be better to pick a latin language? I think that if you know English and some French, then Spanish would come relatively easy – try it out! I’m Cuban and have been trying for years to get my husband to learn Spanish. He claims he’s to old to learn a different language but I have to disagree. My grandmother who never spoke a word of English at age 65 went back to school and learned the language. So we are never too old to learn. I’ll have to tell him about this school. Definitely! Especially since you speak Spanish and your family is Spanish speaking, he should learn 🙂 Good luck! I hate only speaking one language. I found being in Colombia made learning Spanish so much easier. I love programs that help people learn languages. I am currently using Duolingo to help improve some my Spanish. I will have to look into this program. Thanks for this guys! I spent 5 months in Barcelona trying to teach myself Spanish and my progress was sloooow. Now I’m headed to South America this Autumn and I should be at a much higher level than I am. Online classes seem like the perfect solution!! Definitely! For sure give Spanish Marks a try. Also, they teach both Latin American spanish and Spain Spanish :)…there are quite a few differences between the two. Congrats guys! I’m RIGHT there with you – I’m always annoyed when people assume I speak more than one language, mainly because I’m disappointed in myself that I never learned! I too learned Japanese in school, though it never stayed with me, and I did actually learn a bit of Spanish on a Costa Rican volunteer course a while ago, though I dont seem to have a knack for keeping knowledge of language in my head!! Perhaps I should try a class like this. And I LOVE that you found one which gives back to the local community – really nice way to support responsible tourism while advancing yourselves at the same time. Isn’t it annoying?! Glad we’re not the only ones 🙂 I find that learning another language is just easier for some people. Nick is doing much better at learning Spanish than I am, but I’ll get there. I think it’s important to speak Spanish since we’ll be travelling in Spanish speaking countries. I speak English and Greek; trying to learn Spanish and Dutch! I really benefited from the in-person classes I took in Greece through the Greek-American Union there back in 1986 and ’87! Though most of the people in Greece speak English, when you get to some of the smaller villages and less touristy islands, it helps to know Greek! I actually lived there for a little over 4 years, so felt I needed to learn the language–back then, I didn’t have a phone line, let alone a computer! Right now, living in the Netherlands, I’ve been trying to learn Dutch through online Rosetta Stone, but since almost everyone speaks English very well, I’ve been lazy! I moved here from Florida, so felt it would be helpful to learn Spanish. I’ve also been lazy with the course im taking with an App! I took French in high school and college and recall very little of it. In the U.S. I just though of French as a course I needed to get through, and never thought that I might want to travel and use the language! That’s great that you two are getting around to learning Spanish. Sometimes the longer you stay in one place, the more difficult getting serious about learning the language becomes because you loose the excitement. Also, like you said you figure out how to survive and that becomes sufficient. I also had a problem learning in Mexico because lots of the people (especially men) had lived in the US and wanted to keep up the English they had learned. It took a lot of persistence to get them to speak in Spanish to me! Spanish Marks looks like a get way to learn. I’ve considered taking an online course and will check out Spanish Marks. I can talk about most subjects and understand for the most part but still don’t consider myself fluent. A course like this would push me to get on with it 🙂 Thanks for sharing and happy learning. I imagine that your Spanish is MUCH better than ours! I totally understand about trying to get locals to speak Spanish to you, same thing happened to us in Mexico and in Costa Rica – makes practicing hard! Totally know where you are coming from–it’s so easy to come up with excuses when it isn’t completely necessary to learn another language. This looks like such a great way to learn Spanish! I love that you actually have classes with a teacher and homeeork as well. It really seems like this would be a good way to ensure you don’t start slacking–I think we really need to consider this course! We’ve been wanting to learn another language as well and Spanish seems like a good option. Thanks for sharing! This couldn’t have come at a better time for our family. My daughter just got per-approval to do a 10 month student exchange program in South America. She speaks some Spanish as we did a long term home exchange in Spain a few years ago. Like me, she can stumble through a conversation in present tense, but that’s about it. (We haven’t traveled nearly as continuously as you, but people assume we speak second languages as well.). We were going to hire the same private tutor we used before we went to Spain, I am thinking Spanish Marks might be better, as it’s Latin Spanish. What do you think? Would it be a good program for a 15 year old heading for a year in in Latin America? Learning Spanish was one of the most important — and fun! — things I’ve ever done. Glad you’ve found a way to make it work! Fantastic – good for you guys!! It’s never too late 🙂 I’m still learning Urdu after 2 years in Pakistan, and I love it – it’s my second tongue, and I want to speak it as often as possible (although being an English teacher, that’s not as often as I’d like!). Thanks Tim! wow, good for you for learning Urdu, do you find it difficult? Urdu itself isn’t too difficult… the problems are that too many people want to practice their English with me instead of Urdu, and that I’m a bit of a lazy learner!! I still love it though… it would probably be easier if I applied myself properly.